Poutine DOT CO! : The countdown is on! Only a few more weeks until Smoke's Poutinerie opens! The countdown is on! 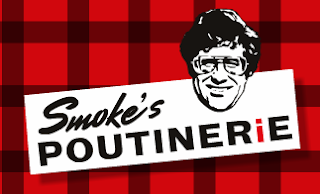 Only a few more weeks until Smoke's Poutinerie opens! Hello fellow Poutineurs and Poutineuses! This is a reminder that Smoke's Poutinerie is opening in only 12 days time - May 16, 2011 May 18 Scratch that - May 20 Monday May 30th! The location is at 132 Albert Street. Are you planning on visiting Smokes Poutinerie in Winnipeg when it opens? I am hoping to. If you are, let us know what you thought of it! This being Manitoba's first poutinerie, they will have high expectations to meet. BUT, here in Manitoba, considering most restaurants (sans fast food chains), use shredded cheese, so it may not be hard to turn people onto Smoke's in the first place. What do I hope from Smoke's Poutinerie? I hope to see local restaurants in Winnipeg and Manitoba to start replacing shredded cheese with curds. I don't go out of my way to look for curds, but in my hometown of Brandon, Manitoba, there are several grocery stores that sell curds.. Safeway, Superstore and Sobeys all sell them. We may see more and more people become poutineurs themselves and develop a love of poutine. I'll be in Winnipeg to check it out, hope to see you there! Update: Tentative opening date has been moved to MAY 30! It appears they're having difficulties that's leading to the delay in opening.